Puidoux: March 2019. The launch of MERGING+ANUBIS on March 21st and the initial showing in Dublin at the AES Convention, prompted a huge reaction on social media and a number of industry forums. 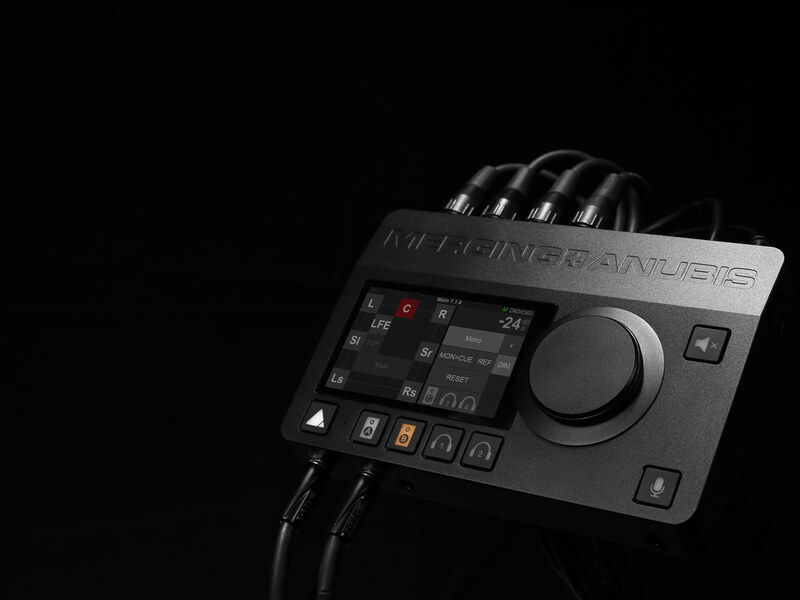 In recognition of the target audience for Prolight+Sound, Merging has opted for stand (8.0 C19) that is centred on this product and that also hints of things to come. One of the Anubis product managers will bring his guitar to the show to demonstrate how Anubis can already be a real boon to musicians on stage and how this preempts a future application. This extremely compact audio interface is a standalone A/D and D/A capable of handling microphone or line level inputs and four analog line outputs, plus two high quality headphone outputs. The large rotary encoder allows for precise monitoring volume control but also makes parameter adjustment simple, while the multi-touch display and dedicated buttons provide intuitive selection of whatever needs to be controlled. Built in talkback, high-quality headphone and cue circuits and speaker management functions make this an ideal unit in any control room or stage. Anubis introduces a new concept of “Modular by Software”; essentially the same hardware can be used for totally different workflows or what we have chosen to call “Missions”. One Mission could be managing your multichannel monitoring in the control room and another Mission might be recording yourself in the studio. The Monitor Mission requires control of multiple speaker sets and headphones with built in talkback, bass management and time alignment plus a host of other features that are essential to manage your listening environment. The future Music Mission currently under development will include ultra-low latency mixing, control of cue feeds, innovative plug-ins, superb mic pres and all the features needed to be the essential musician’s companion. The hidden power of Anubis becomes evident as soon as it becomes part of a larger network. It is remarkably scalable when coupled with Merging’s Hapi or Horus units, or indeed any other AES67 devices. At this point, the additional I/O allows Anubis to become the center of an up to 256 x 256 matrix with the control of incoming and outgoing streams. Instantly, such tasks as immersive audio monitor control become simplicity itself. In addition to audio I/O, Anubis also has GPIO or MIDI connectivity, a range of drivers covering MacOS, Windows and Linux, and even Ambisonic decoding. Although the full roster of features cannot be listed here, it should be noted that Anubis offers the choice of sample rate and audio quality you expect from a Merging product. Practical uses of Anubis in its Monitor role, include control of multiple speaker sets in studios, remote trucks and edit rooms, monitoring incoming AES67 audio streams, recording voice-overs or as a highly portable location recording companion. Power for the Anubis can be supplied using Power over Ethernet (PoE) or a 12V adaptor (included), and both power sources can be used simultaneously for redundancy. Anubis can be placed on a desktop or mounted on a standard microphone stand. Information on MERGING+ANUBIS can be found on the Merging website, here.